Another game that doesn't seem to have been purposed as a playable adventure at all, but instead simply made as some sort of stress test for gamers' sanity. 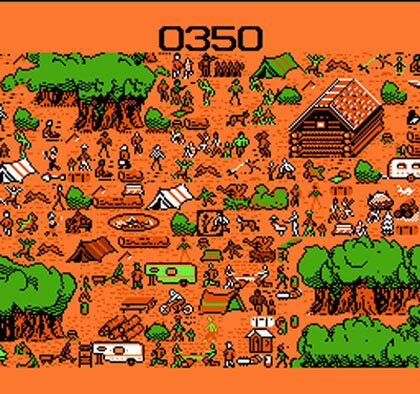 The game alternates between two modes - as Jekyll, you must move very, very slowly through a town full of people and animals who all seem to be interested in making you utterly miserable, whether dropping bombs at your feet, shooting you with slingshots, dropping turds on your head or just constantly assaulting you with musical notes and making it nearly impossible to pass. 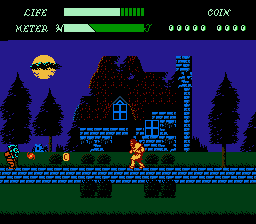 When your sanity finally gets depleted, you become Mr. Hyde and must shoot away at zombies and brain-monsters to restore your sanity before you reach the point in the stage Jekyll reached - if that happens, you get struck by lightning for an immediate game over. The concept is interesting in a way, but trying to play it is absolutely miserable and frustrating beyond belief, particularly when you can't even muster the patience to get through the first level. I guess even that wasn't good enough for Japanese gamers, though, so the US version removes some levels and replaces them with stages be recycled wholesale from earlier in the game. So if you hated that level the first time, be prepared to endure it again! A game as notorious as it is misunderstood, Bokosuka Wars presents itself as an Ys or Zelda styled adventure game, but is actually more of a crude real time strategy title. 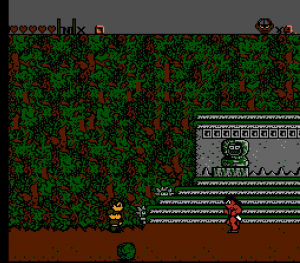 You move your main character around the map, attempting to build an army by touching trees to turn them into soldiers of two different types, and use them to battle enemies. Unfortunately, there's no real strategy to any of these battles - when two units collide, the game just rolls a die, and you have a roughly even chance of seeing the enemy or your own unit die (and if your main character dies, it's an instant game over). You can upgrade units and make them slightly stronger if they win enough battles in a row, but even that doesn't help much when you're so hopelessly outnumbered and combat just boils down to a single roll of the dice. Also definitely not helping its case is the harsh music, which is roughly ten seconds long and loops endlessly throughout each and every battle. Come on guys, Super Mario Brothers managed to have some distinct, catchy tunes that didn't make your ears bleed, and that came out the same year as this game! The single most shameful game ever released by Bethesda Softworks. How do you mess up a simple concept like Where's Waldo? By making all of the graphics so tiny and indecipherable that you can't even find Waldo! I did not doctor that screenshot in any way - you're fully expected to find a tiny sprite of Waldo that looks exactly the same as every other tiny indistinguishable sprite on the screen. They also attempt to mix things up with some minigames like finding Waldo in the dark (just as fun as it sounds), navigating a maze of subway tunnels (ditto) and a slot machine for the final level, but when the core concept of the game is so fundamentally broken, adding more tedium on top only makes it pretty much unbearable. Not to mention that once you figure out all the spots on each screen where Waldo can appear, you can literally complete the game in under three minutes (about 70% of which is just watching him slowly plod from place to place on the map screen. And no, you can't skip it.). All I can say is that thank god Bethesda used the money from this turd to move their efforts upward to much bigger and better things. It's the old formula once again. 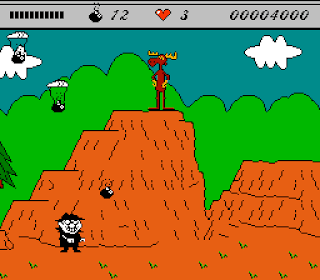 Classic cartoon meets terrible developer and produces a slipshod video game. Rocky and Bullwinkle is definitely one of the worst offenders though, simply for how putrid and nonsensical its design is. Game crashing bugs, lousy hit detection, the fact that you can't attack enemies without losing health (counterintuitiveness at its finest) and nonsensical mechanics (only Bullwinkle can go up stairs?) make it a mess. The fact that it's extremely short, lacks in anything that made the carton memorable and has looping shrill music tracks and such drab, uninspired visuals makes the whole experience pretty much satanic. That's all bad enough, but then you also consider that the game is this late in the NES' lifespan and yet is this awful, and Rocky and Bullwinkle's existence becomes completely inexcusable. As is the fact that Radical Entertainment is still around today after producing such insipid garbage as this, the Terminator, Wayne's World and Bebe's Kids in their early days. A title that left me scarred for life; I'd never even heard of it until the early 2000s, but I saw it in a K-Mart bargain bin for $10, so I figured "why not" and plunked down the cash. Then I went home to play it and... oh lord oh lord, what a mess. 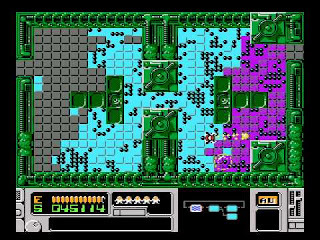 The Mutant Virus is simply broken as a concept, essentially taking Conway's Game of Life and attempting to work it into an action setting. To that end, you shoot the little "viruses" to convert them to your color and hopefully create a chain reaction to crowd out the bad viruses, eventually clearing the board so you can move on. 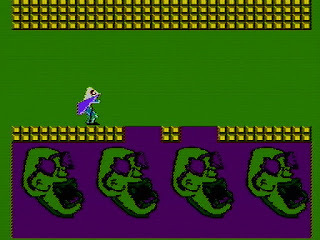 The problem is that this just doesn't work - it doesn't take long before the purple side just starts overwhelming you with such massive numbers that you can't manage to get a foothold at all without collecting a ton of powerups (but good surviving long enough for that!) or going through a lot of tedious trial and error to figure out the exact right spots to shoot at before you get overrun. Also not helping are the sluggish controls with floaty physics that make even getting around, let alone lining up shots, much harder than it should be. An interesting concept but a terrible execution, the Mutant Virus is a game that I and many others should have just left collecting dust. What do you do after you've made one bad game? Color Dreams' answer is apparently "take that same bad game and make it ten times worse"! That's my theory after seeing Secret Scout, at least, a game which takes the core engine of Operation Secret Storm, changes a few graphics and then inexplicably has a spike fly at the back of your head every three seconds as you fight, making surviving the first section of the first stage, let alone the entire game, a near impossibility. Then you dogpile on the usual Color Dreams staples of confusing level layouts, ear-shredding sound effects and music and clumsy hit detection, and you just have an experience that's plain infuriating in its awfulness. Oh, and in stark contrast to the pro-America message of its predecessor, this game literally has you kicking bald eagles to death; that's lovely. Color Dreams made a lot of awful crap, but this is the worst of it in my book. Regarded by all who have played it as one of the worst RPGs ever made, if not the very worst. There's a good reason for that, too, as Hoshi wo Miru Hito is not just bad - it's fundamentally broken in every respect. Your character's movement is excruciatingly slow. Enemies are ludicrously overpowered (throwing spells that completely disable party members with a 100% success rate at you from the outset). You start with no money or equipment and simply have to hope and pray you survive long enough to afford a weapon. The first weapon available is actually weaker than your bare fists, all but dooming you if you buy it. 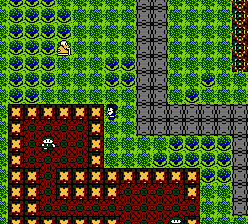 Exiting any town or dungeon puts you right back at the beginning of the game rather than, say, just outside the area you exited. But the most unforgivable flaw has to be its save system, which loses points for being password-based (rather than battery backup) and also for being non-functional as it does not save your progress at all - no matter how far you got in the game, every password puts you back at the start with none of your experience points or levels. All this from a game that came out a full year after Dragon Quest and the same year as the genre-defining Final Fantasy and Phantasy Star. Hoshi Wo Miro Hito is simply inexcusable. Yet somehow the game is also a cult classic, inspiring numerous bug-fixing patches and even an entire fan remake. Japan is crazy, what can I say. 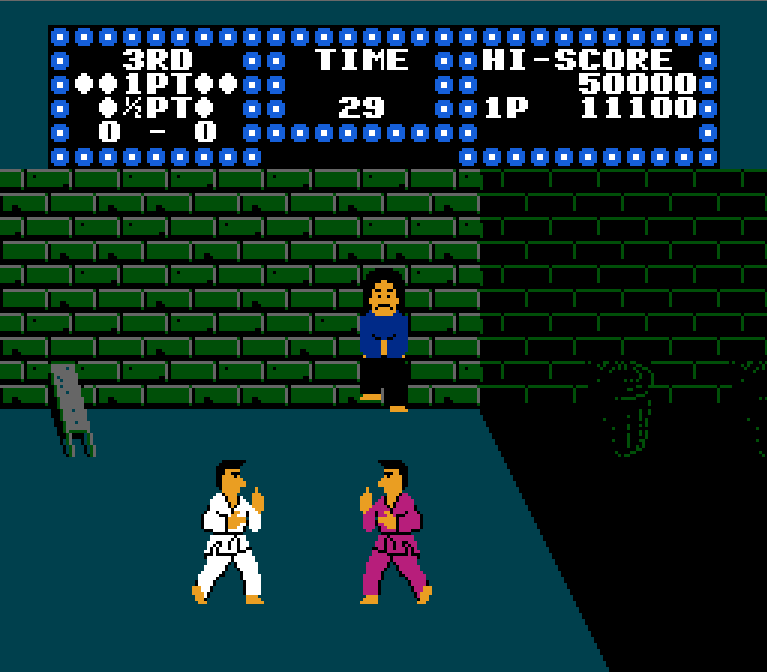 Karate Champ was a pretty popular arcade game in the early 1980s, providing some decent one-on-one fighting action in both single player vs CPU and two-player variants, and even some surprisingly fluid animation for its era. But when it came time to make a home port, Data East completely botched it. Gone were the fluid graphics, smooth gameplay and clever minigames. What remained was an absolute nightmare plagued by incredibly unresponsive controls and nonexistent collision detection that turned every match into the gaming equivalent of watching two blindfolded monkeys swinging sticks at each other while shoulder-deep in mud. 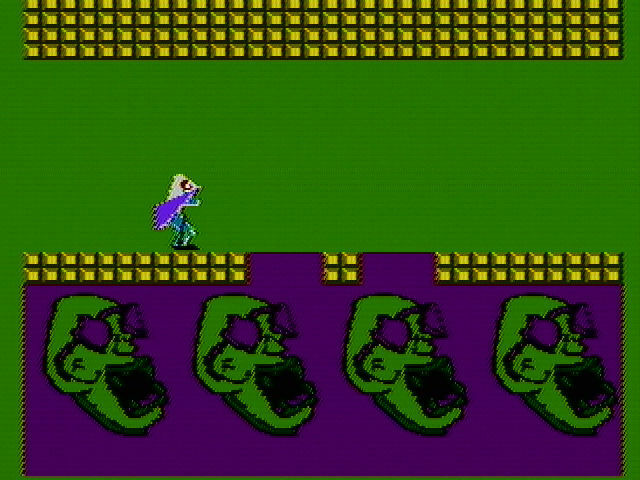 Then the victor gets jars flung at his head that he attempts to bat down (the only minigame in this version) before the next match begins. 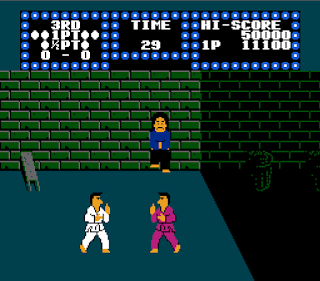 There were a lot of lousy arcade ports on the NES, but the fact that this one is not just bad, but virtually unplayble, and created by the same company that made the original game... that is an absolute travesty. In fact, this may just be the worst one-on-one fighting game ever made, and that is saying something considering the sheer volume of awfulness that genre has brought us! It's extremely rare that one finds a game with no redeeming qualities whatsoever. Even the very worst games out there have at least something to point to and say "well, at least that was okay" - a decent music track, a clever idea with a poor execution, or even some ironic amusement at the sheer ineptitude of its design and the hubris of its developers (see previous entry on this list). 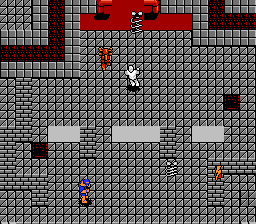 X-Men on the NES, however, is one example of a game completely without merit. Ugly, cluttered and uninspired visuals, ghastly music, sound effects consisting of nothing but square waves and white noise, the worst kind of mindless overhead shooter gameplay, unclear objectives, confusing level layouts, bad AI and a useless HUD that requires you to pause the game to see your remaining health (not that it matters much anyway since there is no recovery time after a hit, meaning any given enemy can knock you dead in a second). Not to mention the complete waste of a license that lends itself perfectly to video game adaptations. Oh, and you can't even complete the game without inputting a very obscure cheat code. 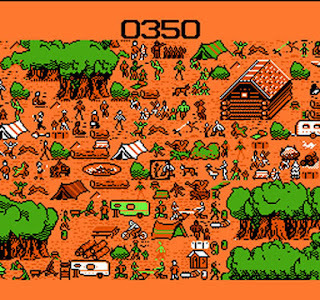 There's not even any ironic entertainment value here; the game is so bland and effortless in every respect that it's as if the developers were actively going out of their way to make sure it was completely unsalvageable, and for that reason it is my pick for the very worst NES game ever created. Who greased whose palms at Nintendo to get the Seal of Quality on this turd? We may never know, but perhaps it's for the best that they remain anonymous.